Between May and June 2018, security information portal and independent security software analyst group Virus Bulletin tested the mettle of 31 different antivirus products. 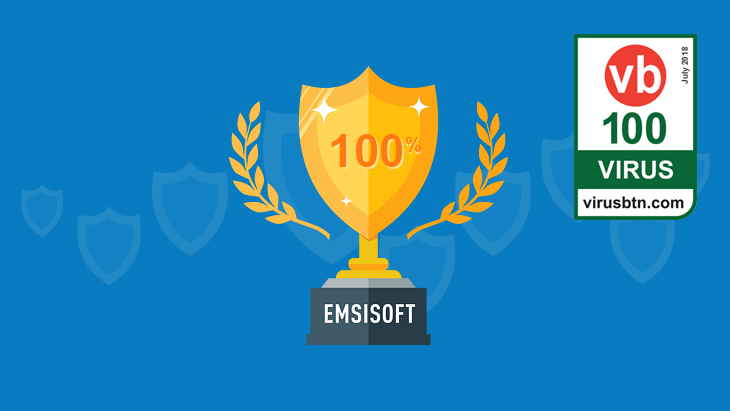 We’re proud to announce that Emsisoft Anti-Malware yet again passed the test with flying colors and was consequently awarded the VB100 certification! How does Virus Bulletin perform the tests? With a history spanning more than two decades, the VB100 certification scheme is an easy way for consumers to quickly identify whether an antivirus product can provide adequate protection. The most recent testing process involved installing a copy of each security product on Windows 10 and Windows 7. The products then scanned the latest version of the WildList (a set of 894 independently curated malware samples) as well as 100,000 clean files that belong to commonly used legitimate software. The test was repeated three times on each operating system. Miss up to 0.5 percent of malware samples. Detect 0.01 percent of the legitimate files as false positives. Virus Bulletin might have relaxed the detection thresholds, but that didn’t stop our software from achieving a perfect score. Emsisoft Anti-Malware detected 100 percent of the malware on the WildList and generated no false positives whatsoever, which meant we ticked all the boxes (and then some) for VB100 certification! As always, we’re proud to see our software recognized by independent testing groups. The results here are a testament to the quality of our software, and we’ll continue working hard to ensure our customers have the best protection possible. Get the full Virus Bulletin report here or check out some of the other awards we’ve won in the past here. Have a fantastic (malware-free) day! Virus Bulletin is a renowned security software testing and certification group headquartered in the UK. The group’s bimonthly VB100 Certification Report provides valuable insight into the detection capabilities of various security products, which can help consumers make a more informed decision about the software they use. A product that has received VB100 certification can generally be trusted to reliably detect most modern malware threats.